Once again it is my turn to be host kitchen for the Bread Baking Babes and as usual, I wanted us to do something different. I've made the Babes start sourdough starters from scratch for my Dark Onion Rye and then I made them not only make Injera but I made them make a whole Ethiopian meal to go with their injera. Well, after this month, I'm pretty sure the girls are going to take my hosting duties away from me because I not only made them once again go scurrying around trying to find strange flours BUT I made them make a bread that didn't need to be kneaded when I chose a gluten free no knead sandwich bread from Nancy Baggett's Kneadlessly Simple for our bread of the month. I've made no knead breads before and gluten free breads before but I have never tried to do both at the same time. Since I have really enjoyed the other recipes from Nancy's fine book I wasn't worried about the recipe (and this one didn't disappoint me). This will be the Bread Baking Babes first no knead bread and our first gluten free bread of the month. Hopefully, it won't our last of either. The thing I was most worried about was some of our gang in Europe easily finding the flours. There were a few folks who had some trouble, but based upon the usual flurry of flour discussions on our super secret blog, I think most everyone had success. The bread has a nice crust, good crumb and other than being a bit dense (common for gluten free breads) was pretty tasty. I'm not sure I would want to live on a diet of this bread but I really enjoyed it toasted spread with almond butter or Nutella. If you want to join us this month as a Bread Baking Buddy, we're giving you a little extra time than the normal one week after our posting to give you some time find the gluten free flours. 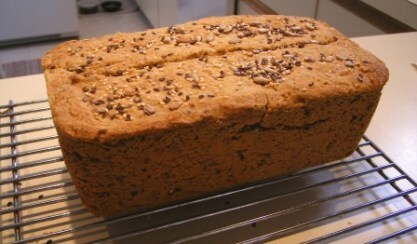 You have until March 31 to make the No Knead Hearty Seeded Sandwich Bread, post about it on your blog and email me a link to your post. 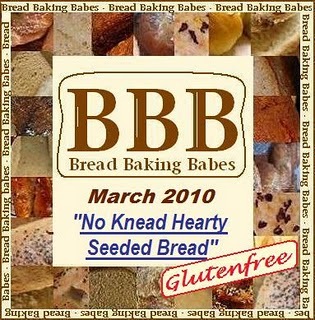 I'll email you a badge for your blog and post a round up off all your wonderful loaves on April 1. I hope you will find this bread as much fun and tasty as I did. To see how the other Babes did with this month's bread, go check out their blogs from the links on my sidebar. 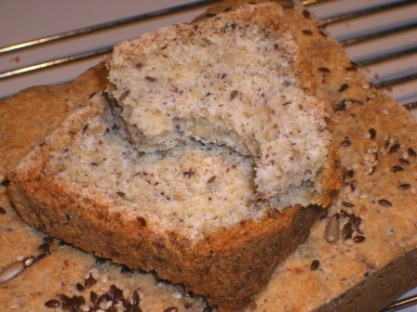 A special thanks to Nancy Baggett for allowing me to post her recipe in full on the blog. If you want to try no knead bread for the first time, I can't recommend a better or easier book to use. So, without further adieu, here is the recipe. from Nancy Baggett's "Kneadlessly Simple"
In large bowl, stir together 1 1/3 cups of white rice flour, cornmeal or brown rice flour, tapioca flour, flax seed meal, salt, yeast, and 2 Tbsp seed mixture. 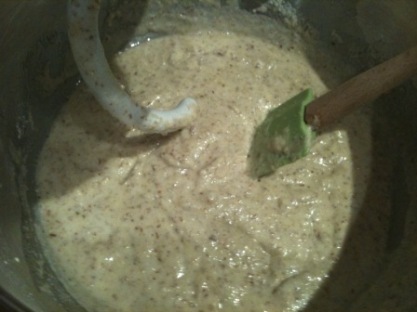 In another bowl, whisk together water, oil, molasses and mix thoroughly with flour mixture. 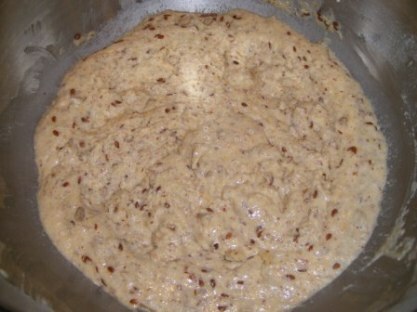 If too stiff to blend, add more water to form a barely firm dough. Tightly cover the bowl with plastic wrap. For best flavor, refrigerate dough for 3 - 10 hrs then let stand at cool room temperature for 12 - 18hrs. 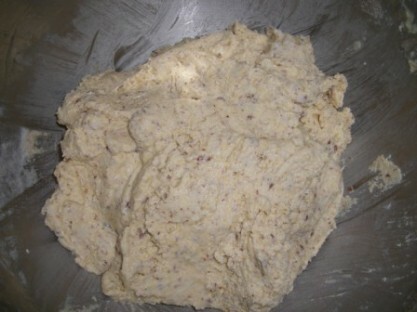 Dough will stiffen as it stands and it is alright if it doesn't rise very much. Whisk egg and set aside 1 Tbsp to brush top of loaf. Stir the yogurt, baking powder, and 1/3 cup white rice flour into the remaining egg. 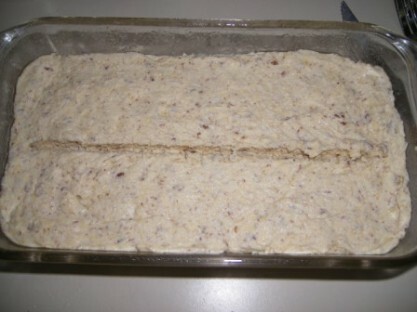 Vigorously stir the yogurt mixture into the First Rise dough until completely mixed. If it is too soft, you can add more of the rice flour (white or brown, doesn't matter which). 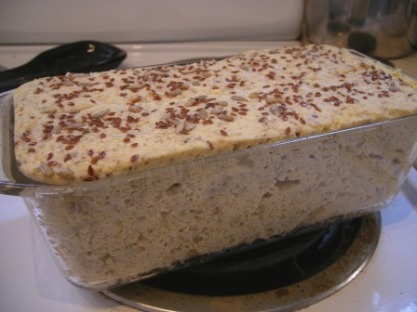 Turn dough into a well greased 9" x 5" loaf pan and brush a little oil on top of loaf. Brush the reserved egg and seeds over the surface. Using a well oiled serrated knife, make a 1/2" deep cut lengthwise down the loaf. Cover the pan with a lightly greased piece of plastic wrap. Let dough stand for 2 1/2 - 4 hrs in a warm room until dough extends 1/8" above the pan rim. Loosen plastic wrap as dough nears top of pan to prevent dough from smooshing down. and let cool completely before slicing.